This is our 3rd summer with the pool. 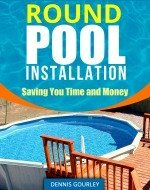 We purchased it from a local company that has been around forever, CROWN POOLS, and went with a 32 x 18 Doughboy pool. It has an 8" seat cap. I can't remember the exact name of the pool. They sunk it into the ground approx three feet on one end which with the slope of the yard translated into about 18 inches dug in on the other end. I have built a deck around the end that is sunk in the most and all the way down the long side. I am still working on the deck on the skimmer end. It's a 5 yr project. HA! HA! Here's my question. I want to fill in the back side with dirt to create a flower bed behind the pool. My intent is to have a flower bed from almost where the skimmer is the entire length of the pool to where it starts curving on the other end. The space is approx 5 feet from the fence to the pool. I will build a short retaining wall at the fence to keep the dirt away from it. The levels of additional dirt will be from approx 1 foot on the far end to approx 26 inches needed to be added on the skimmer end. I keep the pool full year round and realize that under no circumstances should the dirt be higher than water level. My concern is, when I have to replace the liner, will I have a good chance of the pool caving in? The photo basically represents the area that will be filled with dirt. Hi Danny. 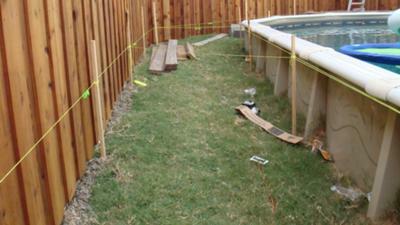 I would build a retaining wall next to the pool as well as the fence. The dirt in a flower be would probably never compress and pack the way a normal dirt backfill would. I would see that as a big problem if the pool were ever drained. The other consideration would be the moisture the dirt would hold from watering the flowers. That would not be good for the pool wall. I would definitely separate the garden from the pool with a wall. The waterfall sounds like a great idea and would be easy to do. Thanks so much for the photo and I hope it all turns out great.